The Swan Song Project gives people facing end of life and bereavement the opportunity to write and record an original song. They record the song and put it on a cd, they can keep their song private or share it on the project website. Ben tells us more about this moving project. “I was inspired to start the project when reminiscing about my grandma and how much I would love to have a recording of her singing with us. I then thought it would be even more incredible to have a recording of her singing something she had written herself. I’ve been obsessed with song writing for a long time and have been running song writing projects in different environments for several years now so I thought I could try and offer it to people nearing the end of their lives. It seemed like such a good idea to me, I was surprised to then find out nobody else seems to be doing it. It took me over a year developing it but then I started sessions at Marie Curie hospice in Bradford last May and it has just gone incredibly well. The sessions are such a pleasure to do and participants and their loved ones have given overwhelming feedback about the benefits. 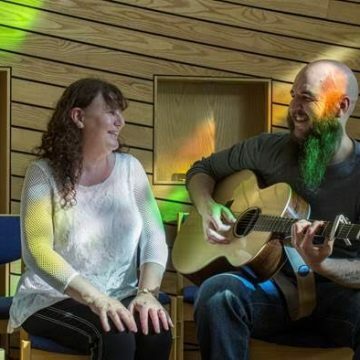 Some write songs for those closest to them expressing things they may not have been able to do face to face, some use it as a chance to reflect on their lives and record their stories, some have said it has helped them come to terms with their condition and it has provided a positive focus in times of distress. Most have a great sense of pride in what they create and several have been played at the writers funerals. The benefits have surpassed my own high expectations for it and I hope they carry on for a long time as the songs live on with loved ones. The sessions work differently for every person. Some come in knowing exactly what they want to write about and how they want it to sound, some have a vague idea and I help them explore and develop it and some come in with no ideas and just start talking until we find something. It’s a really fascinating process and no two sessions are the same, just as no two songs are the same. People say amazing things and don’t realise it a lot of the time. Thank you Ben for talking about this most poignant project. The Swan Song Project has now started working at St Gemma’s Hospice. The term Swan Song derived from the legend that, while they are mute during the rest of their lives, swans sing beautifully and mournfully just before they die. Although this isn’t actually true, swans can make a variety of noises throughout their lives, the idea has carried on. You can follow the self-funding project at www.facebook.com/theswansongproject and also hear some of these inspiring songs.